The holidays are around the corner. For many they bring happiness and cheer. Yet, for some they can be a sad and difficult time. and can be surprisingly strong. It can make us want to crawl into bed, pull the covers over our heads and not come out for a long time. It can sap our energy so we can’t move as fast or think as well. It can make us want to eat – all the wrong things. Sadness isn’t right or wrong. It’s not a voluntary emotion. The body is responding to something amiss. “Just get over it” isn’t the best answer to sadness. We need to process our feelings, comfort ourselves and be comforted by others. It takes time. And yet, most of us need to function with family, in the community, and at work while we’re processing. There are small things you can do that will help lift your spirits so you can keep moving forward – even when you’re sad. This is a list of ten different actions I use to bring myself out of a funk – and why I use them. Most require minimal energy. See if some of it works for you too. You don’t need to do everything on the list in one day. Pick one or two that you can handle, add one or two more after that. There are different levels of sadness, so if you have deep grief that you can’t climb out of in a reasonable amount of time, working with a licensed professional can be of help. 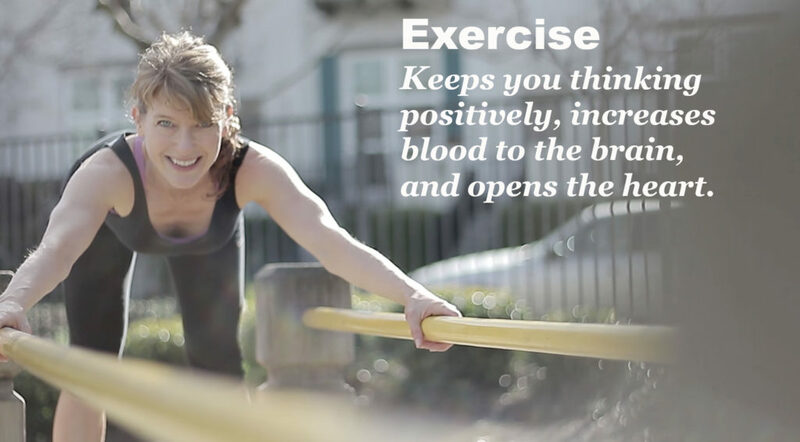 Exercise releases endorphins in the brain. Endorphins are chemicals (endogenous peptides) found especially in the brain that bind to opiate receptors and produce pharmacological-level effects as pain relief (like those of opiates).1 Exercise as early in the day as possible to get these endorphins flowing. While you do, play upbeat music or listen to a motivational speaker to reinforce your uplifting experience. Cardio or strength training will lift your energy; yoga or swimming will calm you. During the day while you work and while you drive, play music that makes you happy or that soothes you. Tea, coffee, or warm water with lemon works. Holding something warm can help you feel comforted. A little caffeine can be a pick-me-up. 5) Wear something you like. Maybe the color makes you smile, maybe it feels nice to touch, maybe you like how it wraps around you like a hug. Or maybe you like the way you look when you see yourself in the mirror. These feelings and sensations can help you to feel happy. 6) Talk with people you like. It may be a friend, someone you admire at work, or even a friendly face at a coffee shop. Get around people who make you smile. Laughter causes the brain to release endorphins.4,5 Watch a funny movie, a stand-up act, or a funny sitcom. Be aware that the craving for chocolate, cheese, or chips may be your body’s reaction to fear, attempt to fill a void, or a blind effort to relieve pain or sadness. If you’re hungry, eat healthy, real food first. Afterwards if you still want the ice cream, you won’t down a whole container of it and call it dinner. A little at the end of your meal might be all you need to feel satisfied. Meanwhile, the healthier foods will give you what you need to sustain your brain and body for productivity and positivity. When we’re not rested, our brain may not have the energy to fight the downhill spiral of the negative. With enough sleep, our brains have the energy to think out of the box, get creative, and be more positive. In sadness, it can be hard to be alone with your thoughts. If meditation is difficult, take some long, deep breaths instead. You don’t have to plan time for it, just do it when you think of it. Breathe in through your nose. When we breathe through the nose, it increases blood oxygen saturation and dilates the blood vessels which improves blood pressure6 and can help you to feel calm. 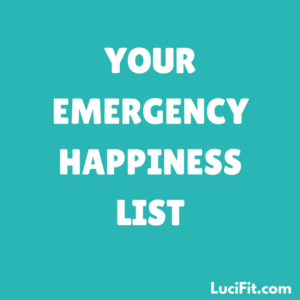 Is there something you find helpful that I didn’t list? Do share in the comments. To your health, dear ones. Djupesland, P., Chatkin, J., Qian, W., & Haight, J. (2001). Nitric oxide in the nasal airway: A new dimension in otorhinolaryngology. American Journal of Otolaryngology, 22(1), 19-32.